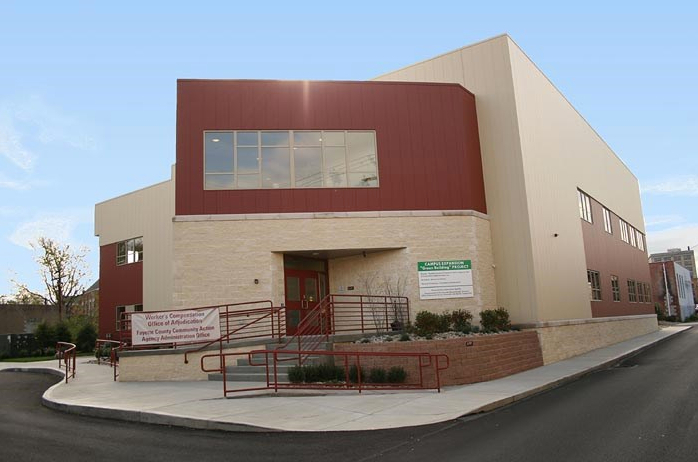 WPPSEF partnered with Community Opportunities and the Fayette County Community Action Agency (FCCAA) to help support the construction of Uniontown’s first LEED building. The new 18,459 sq. ft. building is home to FCCAA and other non-profit organizations. FCCAA earned the distinction of being the first community action agency office building in the U.S. to earn a LEED Silver certification for it’s state-of-the-art energy efficient design. Leading by example, the FCCAA promotes economic and community development, and its new offices offer the agency’s budget–and its funders–a reduction of 30 percent in energy consumption when compared to the building it occupied previously. WPPSEF provided over $1 million dollars in loans and grants to support the construction of Uniontown’s first LEED building. The building was dedicated on May 11, 2007.